On October 30, PESA and BJ Services hosted Rep. Michael McCaul (TX-10) for a tour and meet-and-greet with employees at the BJ Services headquarters in Tomball. Rep. Michael McCaul represents the 10th Congressional district of Texas, which includes Tomball, northwest Houston, Brenham and parts of Austin. Rep. McCaul is currently Chairman of the House Committee on Homeland Security, a position he has held since 2012. Rep. McCaul had the opportunity to tour BJ Services’ Technology Center as well as its manufacturing facility, where he was able to see firsthand how the company’s fracking equipment works, as well as how it produces its fracking fluid and cement casings. The tour was led by BJ Services’ Caleb Barclay, Executive Vice President and Chief Operating Officer, and John Bakht, Executive Vice President and General Counsel. 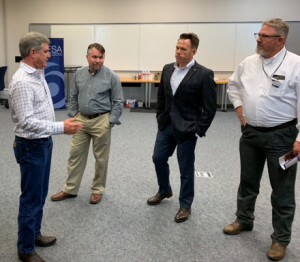 Following the tour, a group of employees gathered to speak with Congressman McCaul about the challenges facing the oil and gas industry, such as workforce shortages, fracking regulations and other issues. This event was the first of many similar events with elected leaders across the country who are influential to the oil and gas industry and related issues. Should your PESA member company be interested in hosting such an event in the future, please contact Tim Tarpley, Vice President Government Affairs.